Siliguri: The Football World Cup fever has gripped Siliguri and surroundings with football enthusiasts across the city set to enjoy the game that kicks off on Thursday. While some are busy packing bags to visit Russia, a few from the town have already reached Moscow to enjoy the ambience. Others are busy buying jerseys and flags of their favourite teams and often indulging into debates with friends on teams and footballers. Like previous years, most football fans are already in two camps - Brazil and Argentina. However, a few are backing Christiano Ronaldo's Portugal some are supporting Andre Iniesta's Spain. At Bidhan Market, the largest marketplace of the city, jerseys of several teams, flags, miniature flags, caps and other items are on sale. "Most are buying flags and jerseys of Argentina and Brazil. A few are even asking whether we have miniature models of players like Lionel Messi or Neymar," said a shopkeeper at Bidhan Market. "I have bought tickets of six matches seven months ago. I will leave for Russia with my two friends on June 17," Sunando Sarkar, a chartered accountant, said. In 2010, Sarkar had been to South Africa to watch the World Cup matches. His friends Sajal Dey, an engineer, and Pradip Karmakar, a jeweller, will accompany him. To trigger the excitement of soccer fans, Siliguri Mahakuma Krira Parishad, the sub-divisional sports body, has planned a procession in the town on Wednesday. "We will organise 'Walk for Football', a procession of football lovers. Representatives from all clubs and school students will be a part of the event. We also have plans to set up a giant screen in front of the Kanchenjungha Stadium to show live telecast of the matches," Nantu Paul, working president of SMKP, said. The civic body, however, has already made the plan to entertain the football lovers. At Bagha Jatin Park, located in heart of the city, the Siliguri Municipal Corporation will show inaugural programme and four live matches on giant screen. "We have planned to show the inaugural match between Russia and Saudi Arabia on Thursday evening from 8.30pm on a large screen at Rabindra Mancha in Bagha Jatin Park. Also, the two quarter-finals on July 6 and July 7 and the final match of the tourney on July 15 will be shown at the same venue. Football enthusiasts can enjoy the matches on the giant screen," said Shankar Ghosh, the member, mayor-in-council (sports, education and cultural activities) at SMC. 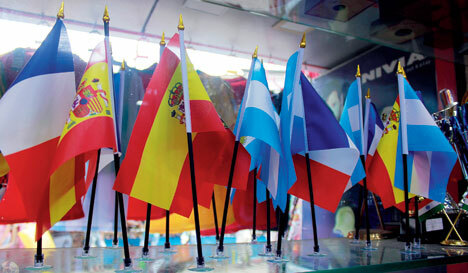 During these days, the park will be decked with flags of all the 32 countries, said Ghosh. The Football World Cup fever has gripped Siliguri and surroundings with football enthusiasts across the city set to enjoy the game that kicks off on Thursday.